Today two of the 2nd grade classes went on a walking field trip to the Madrona Marsh Preserve. 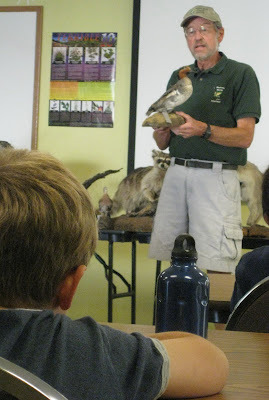 Part of the experience was sitting in the Nature Center and learning about the various birds and wildlife that call the Marsh their home, and then the rest was actually getting to wander around the Marsh itself. Personally, I have the tendency to mock the Madrona Marsh because it looks like a large plot of overgrown weeds that people are very serious about protecting. Most of the plants growing there you would pluck out of your garden should you see them sprouting! Mike's parents have an enormous backyard, which greatly resembles the Marsh, and we've joked several times that we should sell tickets to wander through the shoulder high weeds. Needless to say, this was not really a field trip I was looking forward to with great anticipation. But Nathan noted that I'm spending a lot of time working in Ben's class and not so much time in his this year, so a sense of guilt propelled me to volunteer my day to walk over with the kids. Unfortunately I've been a little under the weather and have completely lost my voice, so I was pretty ineffectual as a chaperone! Being among all the tall grasses and seed pods did nothing for my already ash and smoke-battered sinuses! The kids were very interested in the "stuffed" animals, and kept asking our guide about what exactly the taxidermy process entails. And here is our last photo of Nathan's blue metal water bottle, which he lost somewhere on the Marsh. 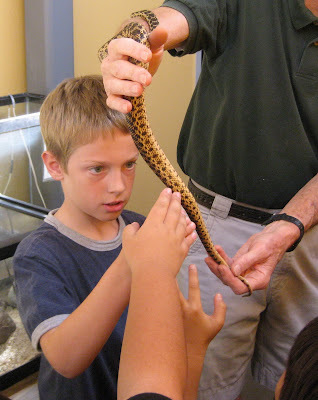 This Gopher Snake is about three years old, and everyone got the chance to touch him, even me! Here's the outside of the Nature Center, with a sample of the brown brush that covers the Marsh. 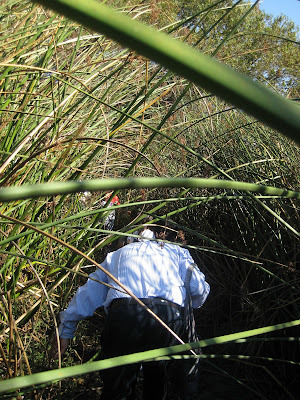 I felt bad for our guide who had to keep all the kids interested in the reproduction cycle of the Tule Reed, when today was the first time in five days they've been allowed to go outside and play! The coolest part for the kids (NOT the adults) was the walk back to the entrance when we got to go through what felt like a never-ending tunnel of the Tule. We got home from the field trip in time for me to load up on antihistamines before picking up Ben from Kindergarten. I had serious deja vu on that last picture of Nathan. 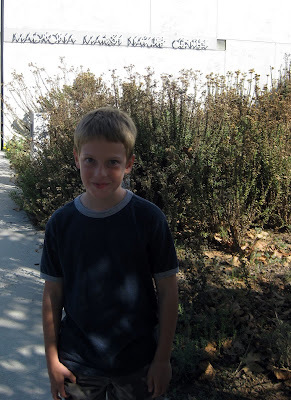 He looked just like the brother who used to terrorize me when I was 4. Maybe it was that little mischevious sparkle in his eye. I know there is a picture of Mike that looks just like it! !